Happy customers make me happy. It’s always nice to receive a thank you note from customers to whom I ship quilts since I don’t get to show them their quilts in person. I got the following today: “Dear Sharon, I just wanted to let you know that I am well pleased with the quilt. My granddaughter was too. She really liked the colors between the rows. She just turned 13. We both wanted to thank you for the hard work you did on her quilt. 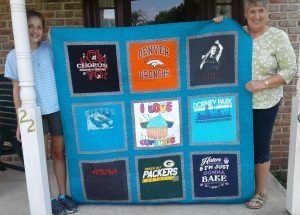 Thank you again.” This lady sent her granddaughter’s t-shirts all the way from Pennsylvania and I know it’s hard to send them so far away, but she liked the quilts on my website. And she was nice enough to share a photo of her and her granddaughter with the quilt.